Fondue is a Swiss tradition - much like the raclette - that Swissmar specializes in. The Swissmar Zuri 11 Piece Ceramic Fondue Set is great for cheese, meat and chocolate fondue, providing simple, fun and elegant entertaining for any dinner party. Fondue is a simple dish shared at the table heated over a small burner. Forks are used to dip bits of food (most often bread or staple foods such as meats, vegetables or fruit) into either delectable melted cheese, oil, broth or chocolate (for dessert). With a fondue pot, you aren't just cooking for your guests - you are cooking with your guests! It makes for a fun, memorable and delicious night with family and friends. 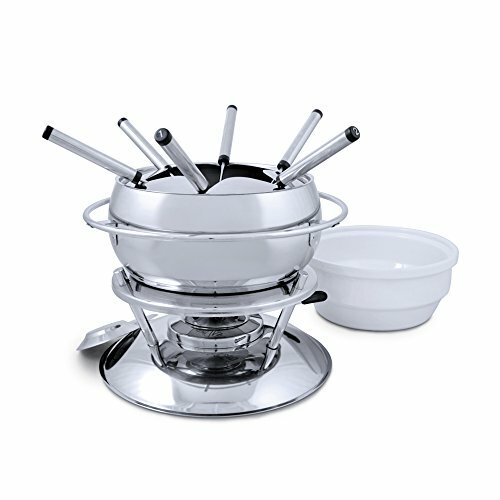 This 11 piece set comes with 1 stainless steel pot, 1 splatter guard, 1 ceramic insert for cheese and chocolate fondue, 1 wrought iron rechaud, 1 fondue burner and 6 fondue forks.